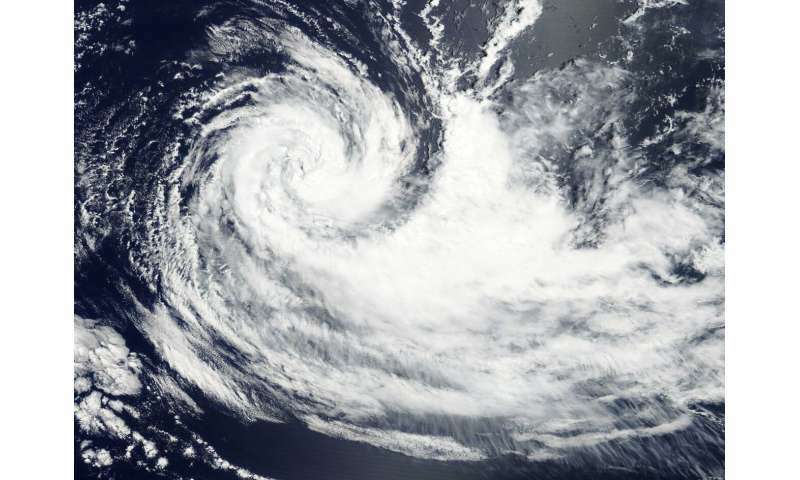 On Feb. 13, 2019, the MODIS instrument aboard NASA's Terra satellite provided a visible image of Tropical Cyclone Gelena in the Southern Indian Ocean that showed bands of thunderstorms spiraling into the center. Credit: NASA Worldview, EARTH Observing System Data and Information System (EOSDIS). On Feb. 13, the Moderate Resolution Imaging Spectroradiometer or MODIS instrument aboard NASA's Terra satellite provided a visible image of Gelena. The image showed bands of thunderstorms spiraling into a cloud-filled, but defined low level circulation with the bulk of its associated convection and clouds pushed eastward from westerly winds. At 10 a.m. EDT (1500 UTC) on Feb. 13, the Joint Typhoon Warning Center or JTWC noted that Oma had maximum sustained winds near 55 knots (63 mph/102 kph). It was centered near 26.0 degrees north latitude and 79.2 degrees east longitude. That's 1,193 nautical miles east-southeast of Port Louis, Mauritius. Omi was moving east-southeast.